The automated Burke-Gaffney Observatory procured another RASC Finest NGC for me, 4216 this time. This object is a fantastic edge-on spiral galaxy in Virgo, surrounded by many other galaxies. Sadly, a satellite went through. The view of NGC 4216 is tantalising with the halo around the core and lumpy dark lanes in the tightly wound disc. Round PGC 39247 is just at the top edge of the grand spiral, due north of 4216's bright core. Immediately to the right or west of 39247 is a tiny round faint fuzz ball: LEDA 1425624. To the south-west, there appears to be another little galaxy but this is not identified as such in SkyTools 3 Professional. Further south-west from PGC 39247 is a little streak of light. This is LEDA 1425156. IC 771, a pretty but small barred spiral galaxy, is to the west of 4216. LEDA 1422933 is due south of 771, a small fuzzy oval. The big edge-on spiral to the south-west of 4216 is NGC 4206. Structure is clearly visible in this neighbouring galaxy. South-east of 4206, at the edge of the image frame, is a round fuzzy. This is LEDA 1419741. 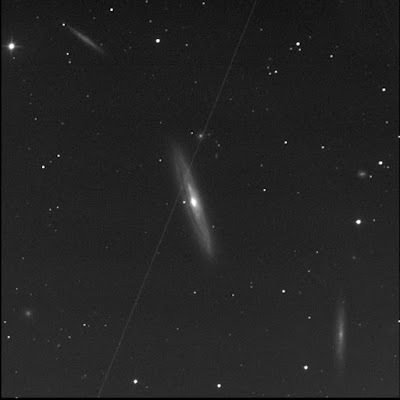 LEDA 1419993 is visible south-east of the NGC 4216. A small round lint ball to the east of star GSC 00879-0604. Almond-shaped LEDA 1420615 is north-east of LEDA 1419993. Further along, in a line with LEDA 1420615 and LEDA 1419993, is MCG 2-31-76. It is large, diffuse, nearly round. North-east of the grand spiral is tiny round LEDA 1425739. Finally, the long streak of NGC 4222 is to the north-east. Three big spirals in the view!